Every now and then I'm just too exhausted at the end of the day to even think about dinner. When I'm feeling like this it's the worst time to get groceries because I always (without fail) end up staring at the boxes of easy "simply add" meals for something so that dinner will be something easy I don't have to think about. Recently I ended up in the Mexican section looking at the wrap kits, hoping something would jump out at me. I picked up this box of "Crispy chicken wraps" from a brand that escapes my memory right now and thought 'That will do', continuing my shopping almost like a zombie. I was actually really happy with my choice. 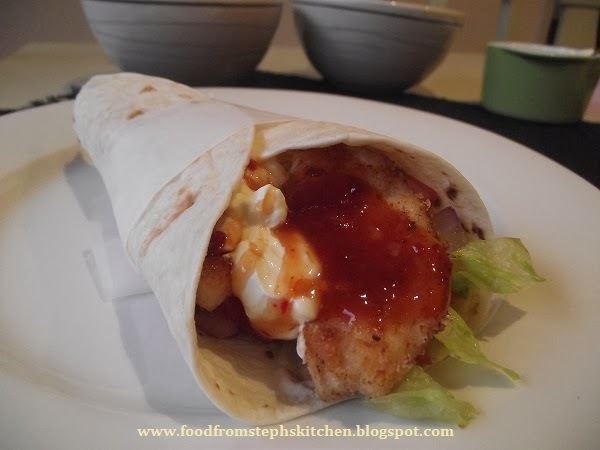 The wraps come with a packet of sweet chilli sauce, the wraps, and a crumb seasoning for the chicken. It was simple, and fresh with all the salad I added to it. The next time I went to the shops I decided instead of spending all that extra money buying something pre-packed for me I'd just look at the ingredients and work it out. Looking over the back of the box I was surprised that there wasn't really much to it, and that I had actually paid a lot for something so easy. 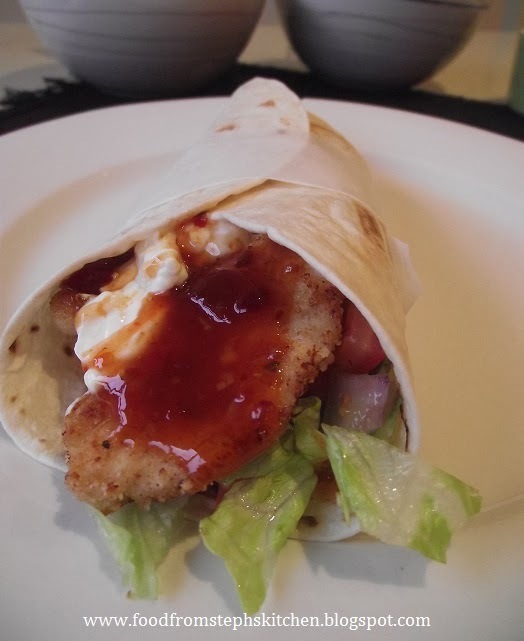 I've now developed my own version of the crispy chicken wraps and haven't bought the boxed product again. To be honest, I think I like my versions of the wraps more, but I could be a little bias. The crispy part of the chicken is an easy herb and spice mix with breadcrumbs that you simply toss the chicken into, and the rest is really just the fresh ingredients you add to it. You'll honestly be really surprised with just how easy it is! Firstly cut up your chicken into strips. I usually cut my chicken breast in half long ways, and then slice each into strips about 0.5 cm wide. In a small bowl combine your cayenne pepper (or paprika) and oregano (or parsley) with your breadcrumbs, mixing them slightly so that the herbs are blended through the breadcrumbs. 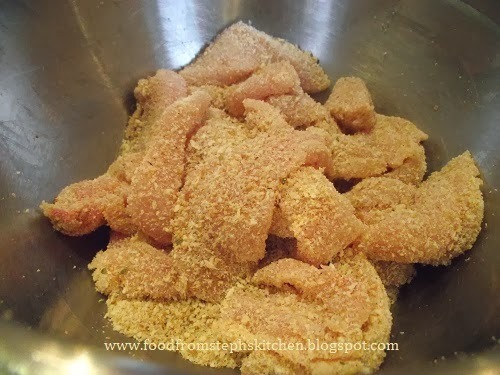 Add all the chicken pieces to the bowl and toss them through the breadcrumbs using tongs or your hands. I actually use my hands because I find it easier and it coats the chicken better. Continue tossing until the chicken is coated on all sides. Put your chicken a side and get started on your salad. This way as soon as you get to cooking the chicken everything else is ready to go. An important thing to remember is to use a different board to what you cut your chicken on as well as using a different or clean knife. You should do this any time you are cutting up meat, but especially with chicken so that you don't contaminate your food. I like to add each salad to a small bowl so that people can make their own wraps at the table, mixing the tomato and onion together into one bowl. 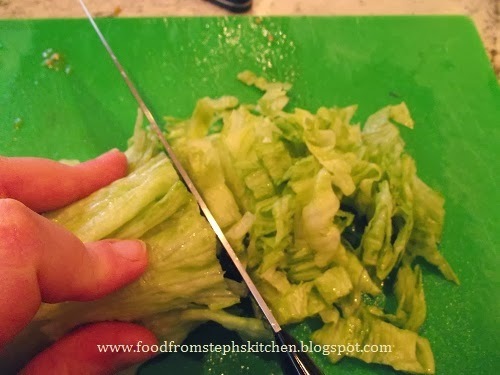 An easy way to shred your lettuce is to lay out all the leaves on top of each other, and then roll them up into a long cylinder before you slice it. Now, back to the chicken. Add the oil to a large frying pan over a medium heat. You want the oil to be a thin layer over the base of the pan, so add more if you need to. When you can hold your hand over the top of the pan and it is hot you can add your chicken. The hand thing is something I do every time I use a frying pan; it's just something my Mum taught me when testing if it's hot enough yet. Add the chicken in a piece at a time, making sure they are not on top of each other. Don't worry if you are thinking 'I can't get all this chicken in the one pan without them being on top of each other!' - don't worry, depending on the size of your pan you might just need to cook the chicken in batches. Add in as much as you can, putting the rest aside until the chicken in the pan cooks and is removed. A good rule of thumb when cooking chicken is to wait until there is a white ring of cooked chicken around the entire edge of the chicken. Once you see this you know you can turn it over and cook the other side. When cooked and crispy on both sides remove your chicken to a plate with paper-towel, and get started on your next batch of chicken. Continue the same way as the first batch, making sure that you start with that thin layer of oil on the bottom. Without that oil your chicken will stick and won't get as crispy. With all your chicken cooked you can now put it in it's own bowl and add it to the collection of salads on the table. It's a lot of fun that way - especially for kids who feel like they are "making their dinner". Of course you don't have to use the salad I have. Picked salads that you know your family will like, even switching the sweet chilli for a BBQ or tomato sauce for the kids and skipping the sour cream. 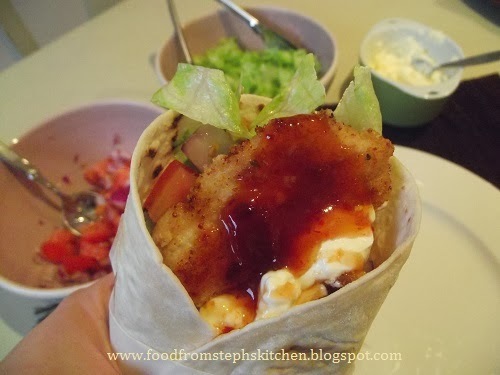 This recipe is also really great for lunches, as you can easily make the wrap a head of time and have it cold. My suggestion though is if you are making it up before hand avoid onion, as the smell just takes over if not fresh. These look fantastic. Thanks for sharing at Simple Supper Tuesday. 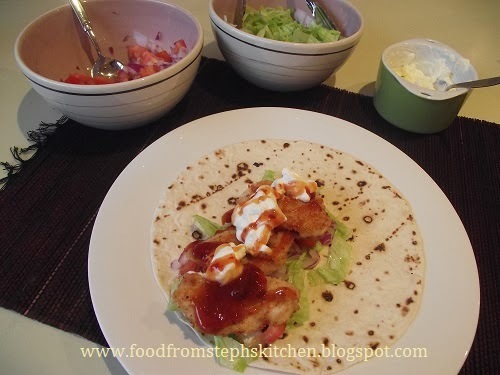 I came across your blog while looking for some chilli chicken recipes and liked a lot. How amazing! I will keep an eye on your post.